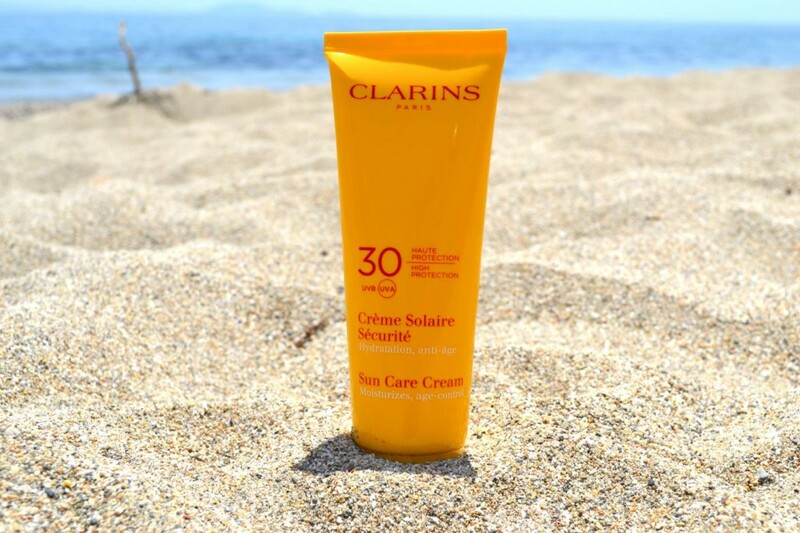 Clarins Sun Care Cream Review – Sun care products have and always will be an extremely important thing to consider especially when you’re going on holiday. Over the past few years there’s been such an increase in publications and people taking an interest in their sun care products and seeing as it’s the time of year when people are getting ready to go on holiday thought it would be a good time to share my Clarins Sun Care Cream Review! As you can see in the pictures, the packaging is bright, cheerful and a product that’s perfectly suited for summer! Most of the sun creams on the market are either in a tube or spray bottle – this is a tube which is great and easy to apply when you’re on the go or relaxing by the sea! I’m SO picky when it comes to sun creams, I don’t like them when they’re sticky or feel heavy on the skin and this is by far one of the best that I’ve used! It applies white but as it gets absorbed by your skin you’re left with a beautiful, healthy glow and after about 5 minutes you can’t really feel it – just silky, soft and smooth! Have you ever applied a sun cream, gone into the sea and then need to re-apply as soon as you’re out and sitting in the sun? Yes, me too! With this you don’t have that problem as you can count on Clarins for bringing you a high-quality product! All you need to do is apply, let it sink into your skin and you’ll be fine for most of the day – if you’re going to be sitting in the sun, just for safety, re-apply a little bit after an hour or so. This smells amazing, think of it like summer in a tube with a refreshing twist! Clarins Sun Care Cream Review – Nourishing? This is the only sun cream that I’ve used to actually hydrate, nourish and protect my skin all in one go! It’s been specially formulated and is wonderful for sensitive skin – it’s lightweight, non-oily and provides great sun protection and this is where you can count on Clarins for quality! It’s water, sand, heat and perspiration resistant so you won’t need to reapply constantly unless you’re like me and can’t get enough of the lovely scent plus it hydrates and nourishes your skin against salt water! I noticed that when I use this sun cream my skin still feels soft and smooth at the end of the day (after showering) compared to if I use another sun cream so that’s a bonus for me as you can tell it works…. I think I’ve said it enough but I am SO impressed with this sun cream, it’s one of the best sun care products that I’ve used and highly recommend it to all you lovely readers!! It might be pricier than normal sun care products BUT you shouldn’t think about money when it comes to protecting your skin against the sun – what’s more important, healthy or money??? I’m going for health. So there we have my favourite sun care cream from Clarins – it’s a great product and I know that I can count on Clarins to deliver high-quality items…. Pricier yes but like I mentioned above what’s more important? Protecting your skin or saving money? Let me know what you all think – I can’t wait to read your comments! Previous Post In Greece, We Wear Blue! Oh wow, that is really thick! It almost looks like a whipped product. I’m way too lazy to apply lotions, which is why I use the sprays, lol. But this does look like it’d feel great on the skin! It seems like an amazing product! And I defenitely need this, as I burn after as much as 15 mins in the sun 🙁 Protecting your skind is indeed the most important thing! Clarins is very good brand!